It’s been an extraordinary season for Team LNT and it’s wonderfully-liveried TVRs. Seven months ago and the European season began with that 1-2 at the Spa 1000 Kms, since when it’s been a year of (largely) promise unfulfilled. There has been real pace apparent every time out, but getting to the finish has been the problem. That pattern, unfortunately, continued at Istanbul, although during the first two days of the meeting, the signs were very promising indeed that the last outing for the T400Rs would see them end their international careers with some (more) real success. The newcomer on the driving squad was Tom Kimber-Smith (right), introduced to the team by Richard Dean, TK-S having shown fabulous form in Team JLR-run Formula Fords. 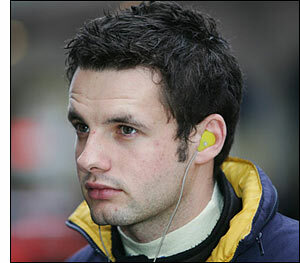 Tom joined Marc Hynes and Pat Pearce in the #82 car, with Jonny Kane, Lawrence Tomlinson and Warren Hughes in the #81. “Wet and cool,” just how we like it, said the team owner on Saturday morning, as the second day of the meeting began. Friday had been dry and cool, but horribly overcast, which seemed to set the pattern for the balance of the three days. Saturday did dry out in time for more free practice and then qualifying, but raceday would be back to wet and cool – but rather wetter than Saturday morning had been. On Friday, the TVRs had been fourth and fifth fastest, with just one Porsche (Autorlando’s) and two Ferraris (those of GPC and Scuderia Ecosse) ahead of them. Jonny Kane set the best time in #81, with new boy Tom Kimber-Smith fastest in #82 – their times split by the boss in #81. 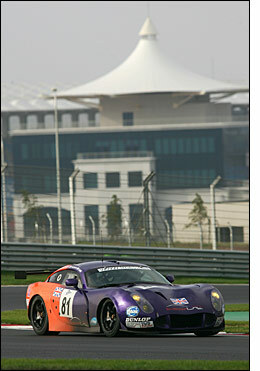 One of the strengths of the TVR squads this weekend would again be the competitiveness of all the drivers. So far, there had been no sign of any engine troubles at all – none. Saturday morning times, on the wet / damp track were ten seconds or so slower than on Friday, and the TVRs were still highly competitive – on intermediate tyres. “The wets were rooted after a couple of laps,” explained Pat Pearce. 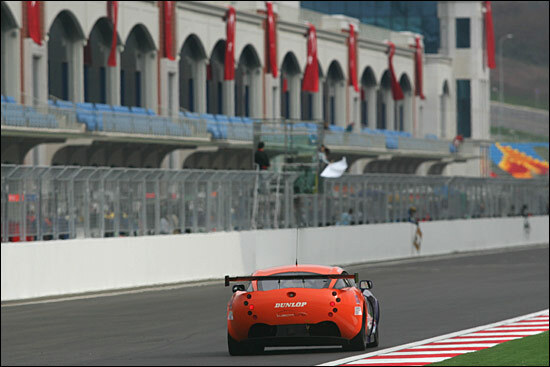 Joining the two Ferraris and the Autorlando Porsche among the competitive GT2 entries was the Spyker, and qualifying and the race looked to be between these four and the two LNT TVRs. Qualifying late on Saturday afternoon was just about dry but still horribly overcast – and Jonny Kane and TK-S had the qualifying duties. Now we could see the real LNT form, with Kane third from the outset, behind the two Ferraris, and consolidating that position with his second flying lap, a 1:56.922. Kimber-Smith was in the very low 1:58s at this point, but he had more to come: he found almost a second with his 1:57.109, and that was the TVRs third and fifth on the grid, split by the Autorlando Porsche with a 1:57 dead. 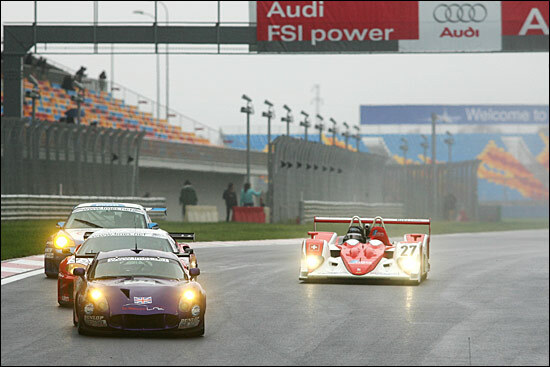 Very satisfying – all the Porsches bar one behind the TVRs, and the Spyker was in trouble with a severe oil leak. The engines were still performing perfectly: two days down, one (raceday) to go. 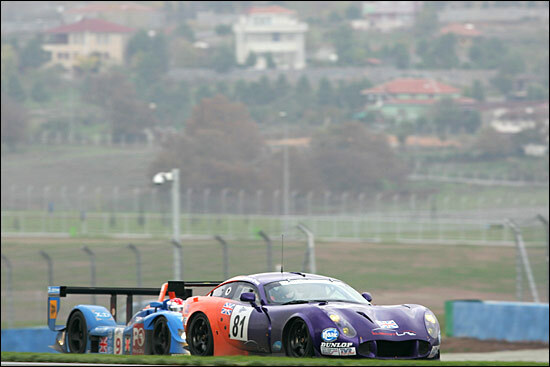 If you were a TVR driver, the positive aspect to race morning was that it was raining again – a solid drizzle. 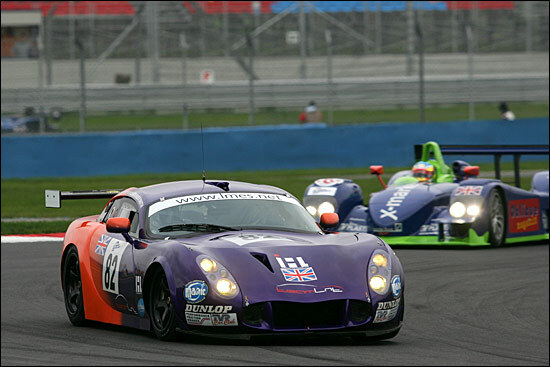 The TVRs were third and fifth, again, in the warm-up, Lawrence Tomlinson setting the time in the third-placed #81. 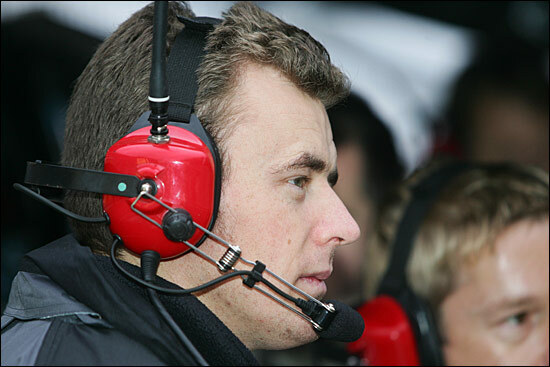 But Marc Hynes came back to the pits clutching an engine component – and without his car. Marc had heard something from the top end, and the next thing he knew, a connecting rod had ventilated the block. That would have to be before one hour of the race had elapsed (ACO / LMES rules), but circumstances would conspire against Pat Pearce making it out onto the track before the first hour had elapsed. ... then dropped to fourth, fought back up to third, fourth again, then third when the Autorlando Porsche spun after 19 laps. But the throttle was sticking, and Jonny had to pit for a replacement. The timing was such that he pitted as Pat Pearce was helmeted up, almost ready to go in #82, with its replacement engine. The crew working on #82 had to switch to fixing #81, and that was it as far as a race went for Pat Pearce, Marc Hynes and Tom Kimber-Smith. He was true to his word, but when Lawrence Tomlinson ventured out, “it stuck again, three times. Once was at the end of the pit straight, and I went straight on. It was too dangerous to continue, so we had to retire the car. The team made up for their disappointment with some fun and games at the ed of season party in Istanbul on Sunday night, but thoughts were already turning to next season. 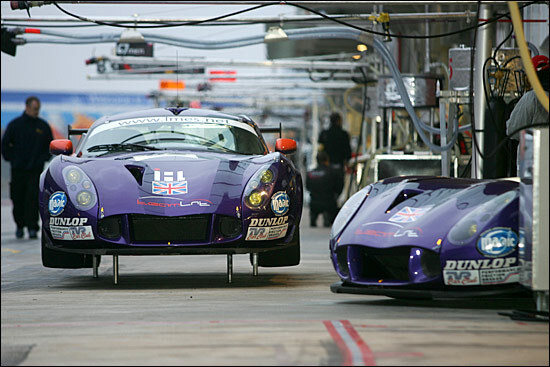 The Team LNT Panoz Esperantes will make their race debut next March, at the 12 Hours of Sebring.